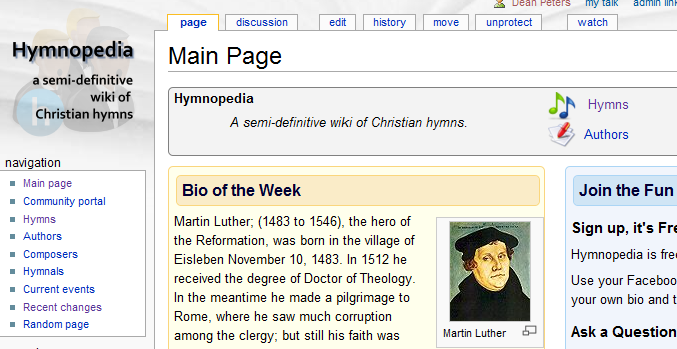 Introducing Hymnopedia.com – a semi-definitive WIKI of Christian hymns.Â Yes folks, I’ve been a way from this blog a bit so I could complete the launch of a site that I hope will become a community of collaborators on those classic hymns of the Christian faith that express our joy in the good time, sooth our sorrows in the bad times, and heal us when we’re hurting. There’s quite a bit of back-end work that went on to make this launch. I’ll write about it more a bit later. Now it’s late and I need some sleep. Nothing makes for a stellar Christmas performance of Oh Holy Night like having a MIDI track you can play and practice with on your computer … well except maybe for the same track on your favorite MP3 player or SmartPhone that you can tote around as your personal and portable accompanist. That’s what I did with a nifty little tool appropriately entitled “Direct MIDI to MP3/WAV Converter” by Piston Software. Even better, I was also able to use Direct MIDI to MP3/WAV Converter to create WAV files I could then incorporate as sound tracks into the movie maker software that came packed with my laptop. As I’m planning on another live performance of Dvorak’s 10 Biblical Songs that I wrote about on this blog back on 2002; only this time around I plan on follow-up with digital recordings. 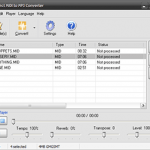 TheÂ Direct MIDI to MP3/WAV conversion tool will come in handy for making accompaniment tracks for my iPod, as well as master destination tracks for my multi-track digital recording that I’ll mix down and post onto iTunes. And if I find myself rehearsing for some Easter Cantata, you can be sure I’ll be creating MP3s of each SABT vocal track to distribute those about me so that the poor conductor or music minister doesn’t go batty from flat basses and sharp sopranos. Now pardon me while I use Direct MIDI to MP3/WAV Converter one more time to make another background score to accompany some pictures of this morning’s Christmas cheer. And even if you’re not into rolling your own music scores and accompaniments, I want to wish everyone a very blessed Christmas and a healthy and safe 2011. 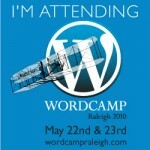 Once more, I’m live blogging from WordPress WordCamp Raleigh (#wcraleigh) here at the Sheraton in Downtown Raleigh. I’ll be posting notes from sessions on managing events in WordPress and how powerusers can get the most out of multimedia via WordPress. Stay-tuned, I’ll be posting often all morning. I didn’t read the schedule close enough, today’s events start at 9:30 AM rather than 9:00 … so I’m here early. Makes me all the gladder that I didn’t speed to get here as NC64/I40 East from exit 293 to 298 are crawling with Raleigh Police issuing speeding citations. Me, I had the cruise control set as I listened to some Pentecost chants and plainsongs being played on the local classical music station. As I get here, no surprise, a 17 year old attendee is up bright and early, while some others are lightly snoring on the mezzanine couches & chairs outside the meeting rooms. From what I glean from last night’s #WCRaleigh Tweets – there were several folks up very late having a good time. Anyway, I’ll be live blogging from two sessions today, one for programmers on organizing events … the other for power users on podcasting, streaming, multi-media and fun like that. One advantage to living in the peak of good living,Â Apex, NC, is that I’m about a 15 to 20 minute drive from downtown Raleigh, the site of WordCamp Raleigh 2010 – where today I’ll put on my best effort to live blog about the various sessions and people I discover here. I already know it’s going to be a fun morning as I no only discovered free parking a block away from the Sheraton in which the conference is held, but my spot was in front of a Starbucks, with none other than iThemes creator Cory Miller &Â friend sitting at a table just in front of the spot – as if to reserve my place. I’ve also run into another online BFF, WordPress ninja Nathan Rice and social media guru Wayne Sutton. Anyway, hopefully I’ll learn much about the upcoming release of WordPress 3.0. 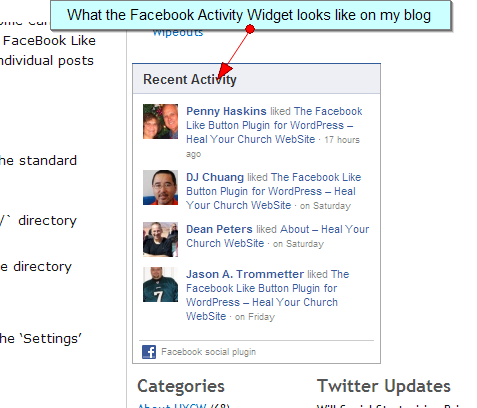 I’m pleased to announce the initial release of my 2nd social media plugin, the Facebook Activity Widget Plugin for WordPress. 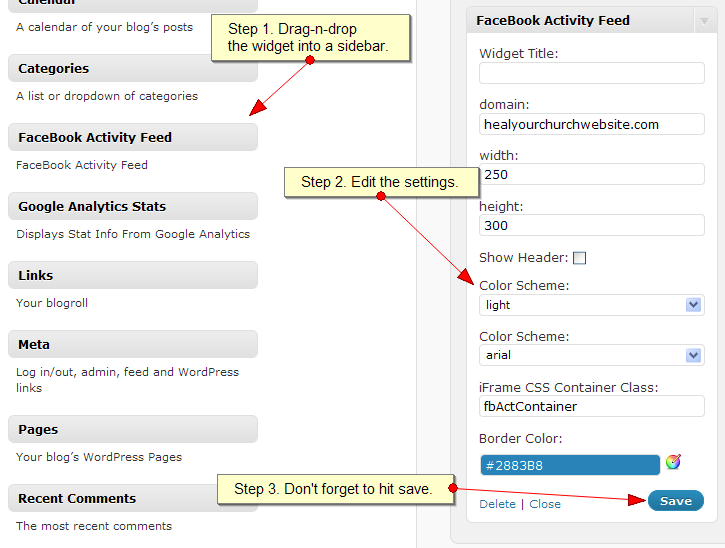 Simply put, it automates the display of a Facebook Activity Feed on the sidebar of your blog by making it a easy-to-configure widget. For those who may not be aware of what the Facebook Activity Feed is, it is a ‘social plugin’Â displays the most interesting recent activity taking place on your personal website and/or blog. Since the content is hosted by Facebook, the plugin can display personalized content whether or not the user has logged into your site. The activity feed displays stories both when users like content on your site and when users share content from your site back to Facebook.Â You can read more about this over onÂ the Facebook Activity Feed reference page. NOTE – for those of you early adopters, looks like the WordPress repository did NOT give me the file name/path I requested. So unfortunately, deactivate and delete version 0.1 before installing v0.2. Yeah, I know, whattaÂ pain. Upload the ‘fbactivitywidget.zip’ file to the `/wp-content/plugins/` directory using wget, curl of ftp. Modify the fields to choice and click save..
Everything is pretty obvious from there – with the exception of the ‘domain’ parameter. Basically, it is the domain of your personal website and/or blog without the “http://” or “www.” prefixes. You specify a domain to show activity for. 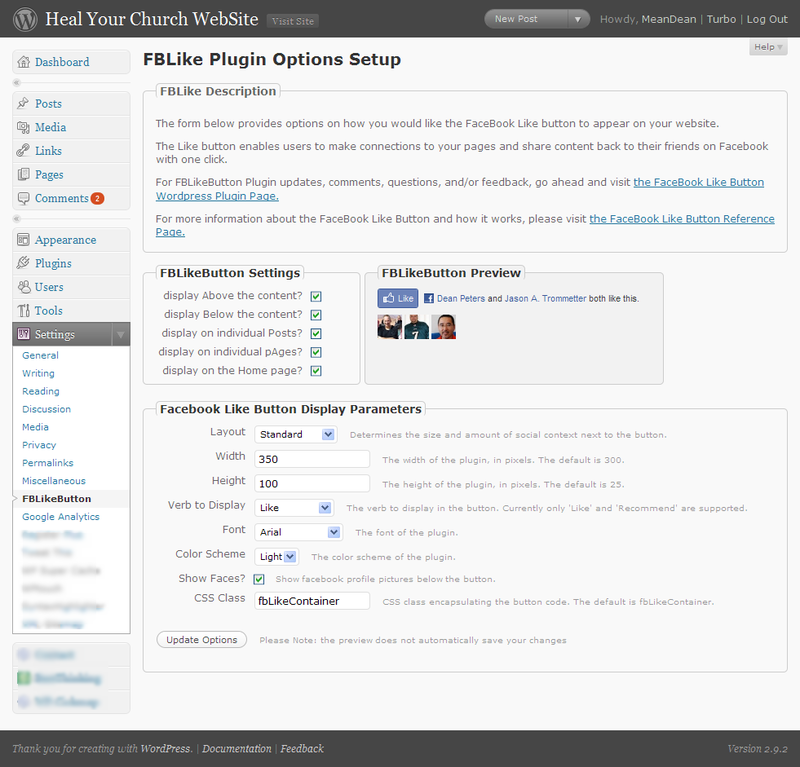 The domain is matched exactly, so a plugin with site=healyourchurchwebsite.com would not include activity from obfuscator.healyourchurchwebsite.com. According to Facebook, currently you cannot currently aggregate across multiple domains. Also, Iâ€™m currently in the process of setting getting established with the WordPress SVN and everything else that goes with publishing an official WordPress plugin. The plugin is now available from the WordPress Repository, until I can get the plugin its ownhome on the WordPress Plugin repository. Keep in mind it is version 0.1 version 0.2 – so expect more to come! 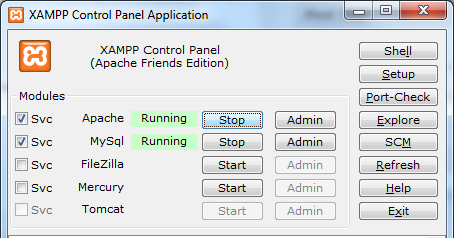 As NOTED before, if you implemented version 0.1, de-activate and delete first before installing 0.2 and later versions. I don’t know if I’m going to build an entire suite of Facebook Social Plugins for WordPress, but with today’s deployment, that at least gives me two. In case you’re not a regular at this blog, last week I delivered: The Facebook Like Button Plugin for WordPress. Unlike it’s cousin here, will display the Facebook Like Button above and/or below your posts and/or pages. I said this in my last post … but it bears repeating … please donâ€™t forget to click the FaceBook Like Button for this post â€¦ Iâ€™d appreciate it. A shout–out of thanks for the immediate feedback goes out to Benjain, Julien, Tim, Jason, Dave, and Chuck. Debating using WordPress 3.0 as your CMS? Here’s 20 ‘Brand Name’ reasons to say Yes! With the release of WordPress 3.0 right around the corner, I thought I might offer some perspective to those arguing against said tool as a professional content management platform.